Diabetic retinopathy is a complication of diabetes that weakens the blood vessels that supply nourishment to the retina (the light-sensitive lining in the back of the eye where vision is focused). These weak vessels can leak, swell or develop thin branches, causing a loss of vision. Changes to your vision may not be noticeable at first. But in its advanced stages, the disease can cause blurred or cloudy vision, floaters and blind spots – and, eventually, blindness. This damage is irreversible. Diabetic retinopathy is the most common diabetic eye complication and a leading cause of blindness in American adults. 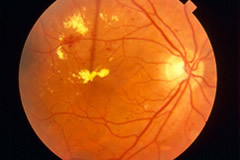 Macular edema, which is leaking fluid that causes blurred vision, often occurs with diabetic retinopathy. Fortunately, diabetic retinopathy is preventable. People with diabetes are most susceptible to developing it, but your risk is reduced if you follow your prescribed diet and medications, exercise regularly, control your blood pressure, and avoid alcohol and cigarettes. Regular eye exams are an integral part of making sure your eyes are healthy. Diabetic retinopathy can be detected through a dilated eye exam. Although damage caused by diabetic retinopathy cannot be corrected, patients diagnosed with the condition can be treated to slow its progression and prevent further vision loss. Treatment modalities include injections of certain medications, laser and surgical procedures. The macula is a part of the retina in the back of the eye that ensures that our central vision is clear and sharp. Age-related macular degeneration (AMD) occurs when the vison processing cells in the center of the retina begin to weaken and die, causing vision loss. Patients may experience anything from a blurry, gray or distorted area to a blind spot in the center of vision. There are two kinds of AMD: wet (neovascular/exudative) and dry (non-neovascular). About 10-15% of people with AMD have the wet form. “Neovascular” means “new vessels.” Accordingly, wet AMD occurs when new blood vessels grow into the retina. These new vessels are very fragile, and often leak blood and fluid between the layers of the retina. Not only does this leakage distort vision, but when the blood dries, scar tissue forms on the retina as well. This creates a dark spot in the patient’s vision. Dry AMD is much more common than wet AMD. 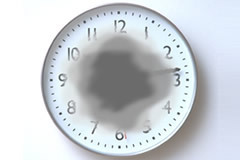 Patients with this type of macular degeneration do not experience new vessel growth. Instead, symptoms include thinning of the retina, loss of retinal pigment and the formation of small, round particles inside the retina called drusen. Vision loss with dry AMD is slower than with wet AMD. Treatment includes a recomendation to STOP SMOKING, and to start taking certain vitamins identified in the Age-related eye disease study (AREDS) published in 2001. AREDS 2 results will hopefully be available in 2013 and clarify whether vitamin A is helpful, as well as whether Omega 3 supplements and lutein are beneficial in reducing the progression of the disease. Ask your ophthalmologist to recommend the appropriate supplements for you based upon your medical and smoking history. Patients with wet AMD will most likely benefit from injections of certain medications into the eye. To prevent permanent vision loss, the retina must be quickly reattached. 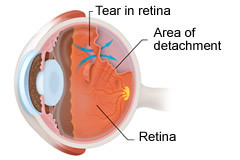 Treatment for retinal detachment can be done through surgery. Laser photocoagulation can be beneficial when a hole is identified in the retina but before the retina detaches. Laser seals off holes in the retina preventing fluid in the eye from going down the hole and detaching the retina. It is often used during surgery to repair retinal detachments as well as with pneumatic retinopexy, a procedure that creates a gas bubble within the vitreous gel and then expands to place pressure against the retina thereby helping with reattachment. Plaquenil is a medication prescribed for connective tissue diseases such as rheumatoid arthritis and lupus. However, this drug can prove toxic to the retina and threaten the vision. Regular eye examinations are essential for those taking plaquenil because over time the retina can be damaged beyond repair and monitoring is the only way to ensure that toxicity is not occurring. The drug accumulates within the retina and can remain there for years even after it has been discontinued. Baseline testing of the eyes is recommended before beginning treatment with Plaquenil. Once taking the medication regularly, standard exams should include a dilated assessment and visual field test. In some cases, color vision testing, retinal photography, and other retinal imaging studies are recommended as well. » For more information on Retina or to make an appointment, call us at either our Philadelphia office 215-627-1515 or our Ardmore office 610-649-7616.